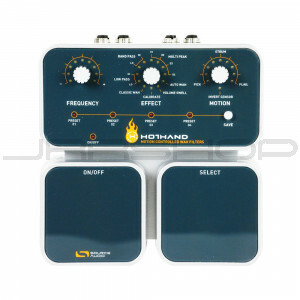 The Hot Hand Motion-Controlled Wah Filters is the world’s first motion-controlled effects unit. It utilizes a motion sensor mounted in a ring to capture a player’s movement and uses that data to control the sweep of a Wah filter. It provides an unprecedented level of control and expressiveness and offers the artist a new way of manipulating effects. Eleven effect types are included and each can be customized and stored in one of four presets. 11 effect types including Classic Wah model, 2 Low Pass, 2 Band Pass, 4 Multi Peak, Auto-Wah mode, and Volume Swell. 4 easy to store and easy to recall presets for saving user settings. Frequency knob controls starting point of the sweep. Motion knob controls sensitivity of the motions sensor for use with small or big movements. Active Analog Bypass provides full analog routing during bypass and prevents signal degradation in long effects chains. Simple user interface; sleek design; rugged aluminum enclosure. 24 bit A/D- D/A converters and 56-bit processing ensure low noise and professional quality sound. Expression Input for use with an expression pedal. Expression Output for sending Hot Hand control signals to an external effects box or keyboard. Full signal range allows use with keyboards, bass, etc. Sensor Output allows daisy chaining of multiple Hot Hand devices. Dimensions: 7-1/8 in. (length not including I/O jacks) x 7-1/8 in. (width) x 2 in (height, including knobs).